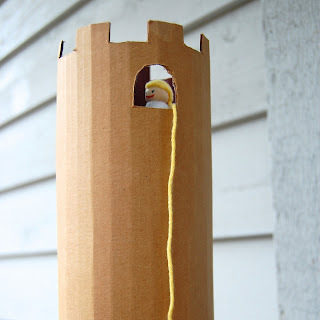 I've been working with cardboard even longer than I've been sewing and working with fabric. 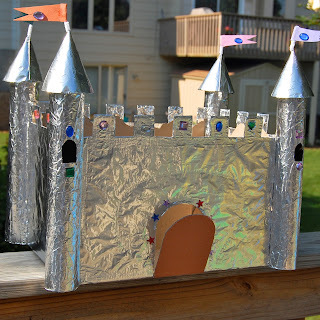 One of my most-used toys as a kid was a roll of scotch tape, with which I assembled all kinds of structures with found objects around the house. Whenever we had access to cardboard, which wasn't as often as I wished, and certainly nowhere as often as I have now, I was practically in heaven. 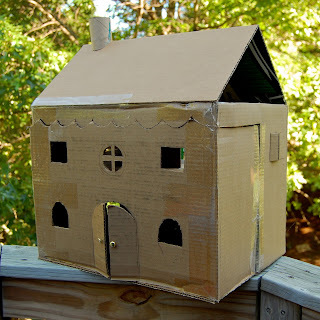 Because I never had formal cardboard-builing lessons or read any books on how to work with cardboard, I imagined that everyone else also just winged it with cardboard. The fun has always been in the designing, experimenting and making. But based on the many requests I've received from readers, I'm thinking maybe I assumed wrong. 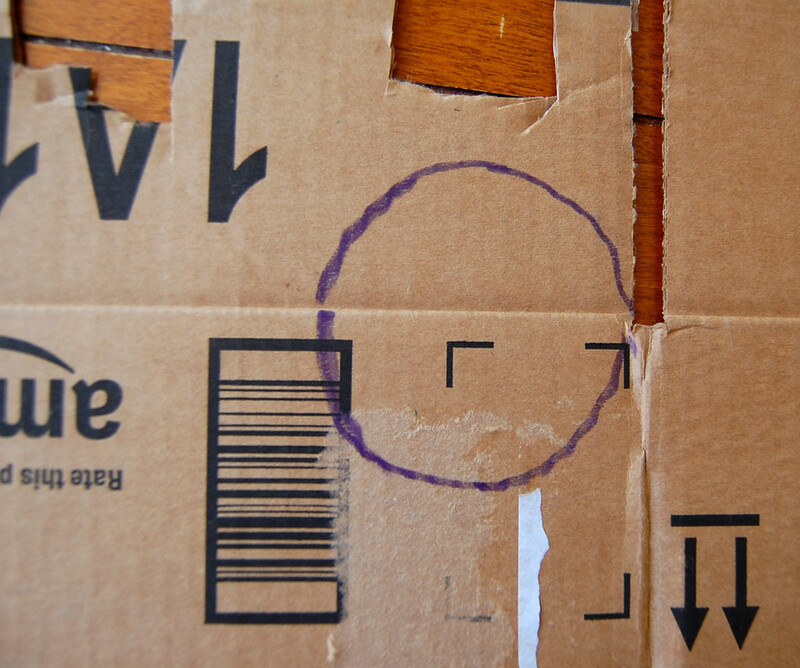 So today I am happy to share with you as much as I know about cardboard. Righto - now that we're all properly demoralized inspired, let's begin! It is (in most cases) free. 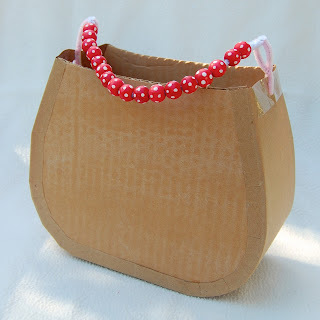 It appeals to the environmentally-conscious, pro-recycling parts of our human nature. It is disposable - toss it back into the recycling bin when you're done playing. It sneaks into your home each time you bring groceries and sundries in from the store. Look for it housing cereal and diapers, on the backs of writing tablets, in between folded bedlinen. 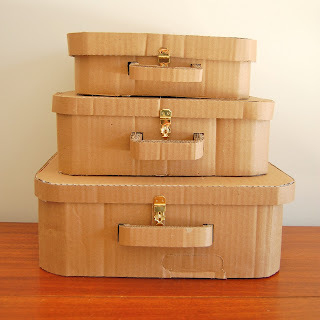 If you know of people who've recently moved into your neighborhood, bring them a casserole and then beg them for their moving boxes - these are often made of exceptionally sturdy cardboard. 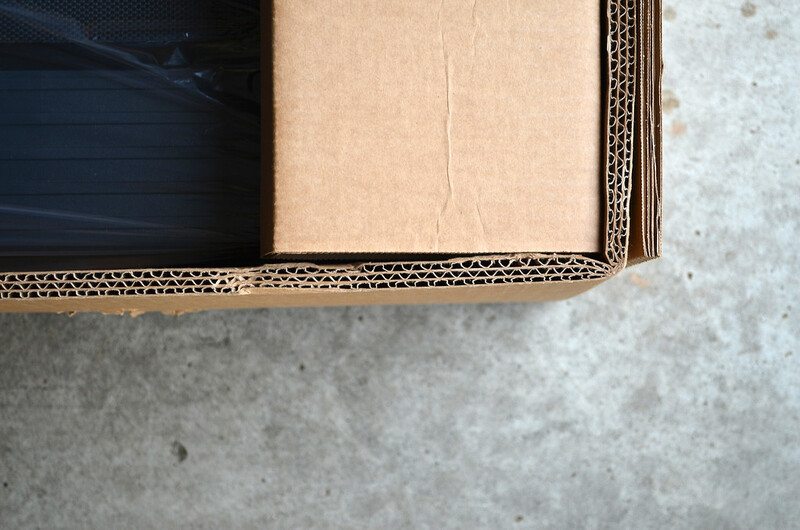 Bring your kids to supermarkets and members' clubs like Sam's Club and Costco, and ask the staff for cardboard boxes and the giant sheets that line their pallets. They are usually only too happy to oblige, especially when you say it's for a children's craft project. Conduct surveillance on your husband's (I'm stereotyping here) home improvement adventures and ferret away all the packing boxes from lawn edging, shower doors, etc. Wait for your freezer/TV/computer to die and then order replacements based on which ones come in the best cardboard boxes. Save all the shipping boxes that come in the post. 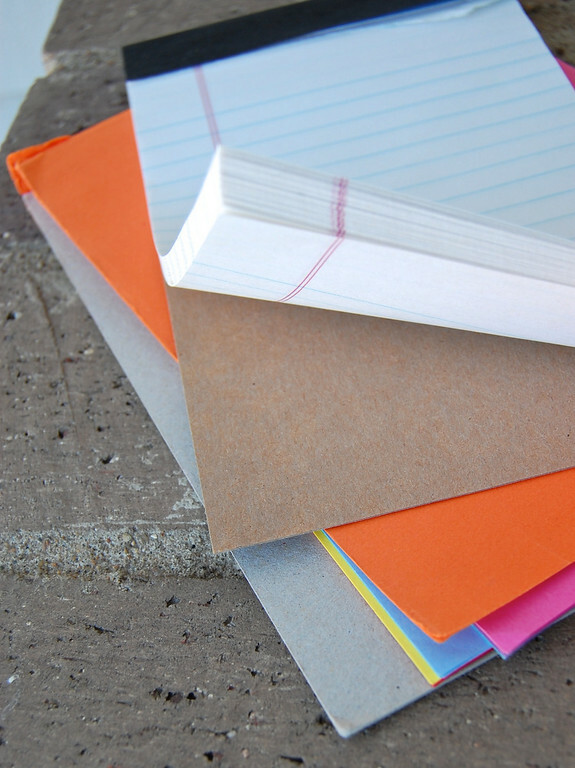 Buy them - but only as the last resort, after scavenging all other free sources - from office supply stores. How Do I Build A Cardboard Stash? Throw every cardboard box you find into it. 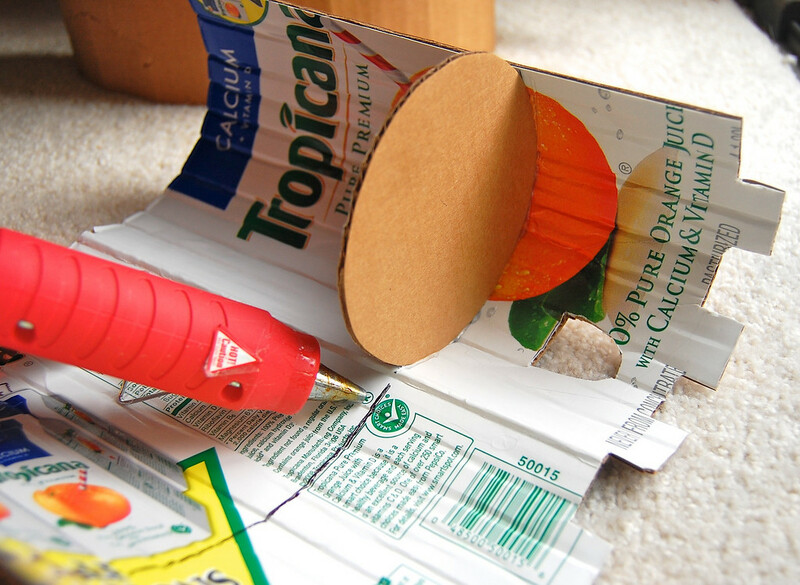 Cut open and flatten every cardboard box you find. Slide them under beds. Or between the mattress and box spring. Or behind the headboard. 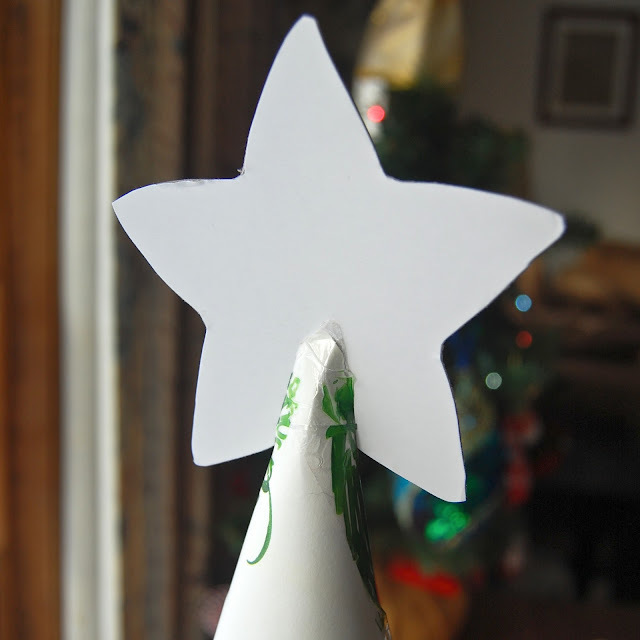 Save silly little things like the inner tubes of toilet paper, paper towels and wrapping paper. 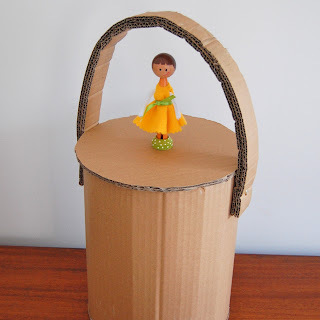 You work primarily with cardboard boxes to turn them into things that retain the structure of the box. So stuff like cars, puppet stages, ovens, personal rocketships, that sort of thing. 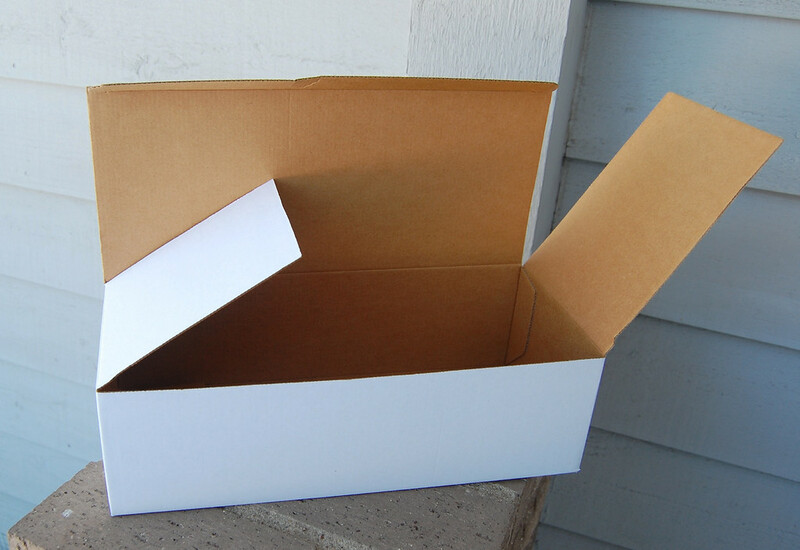 When you see a cardboard box, your first thought is what you could make out of it that has those dimensions. 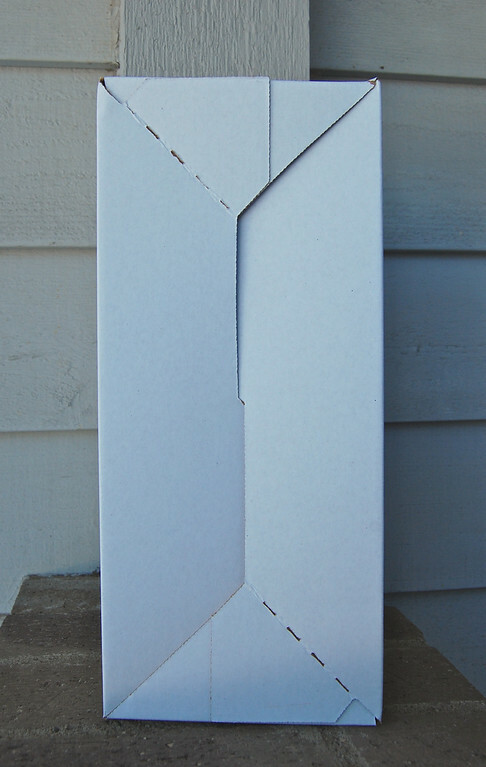 You love that the box already has corners and a flap and sides to work around. 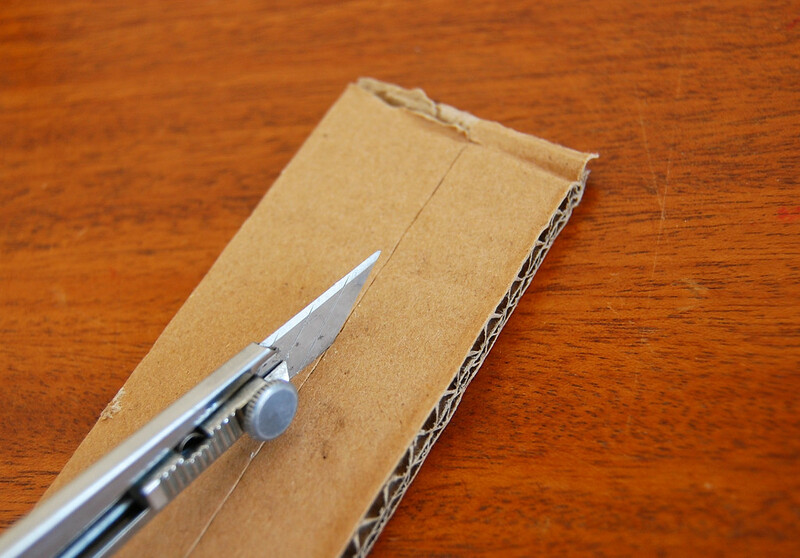 You're probably blind to regular sheets of cardboard lying around, or you think, "Hm, I wonder if I could use that as a cutting mat. Or maybe my kids might like to color on it." If you were working with fabric, you'd be the one cutting up men's shirts and turning them into girl's frocks while retaining the button plackets, bottom hems and collars. 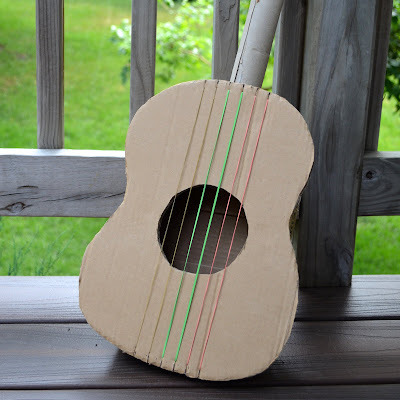 You will use any cardboard to make anything. 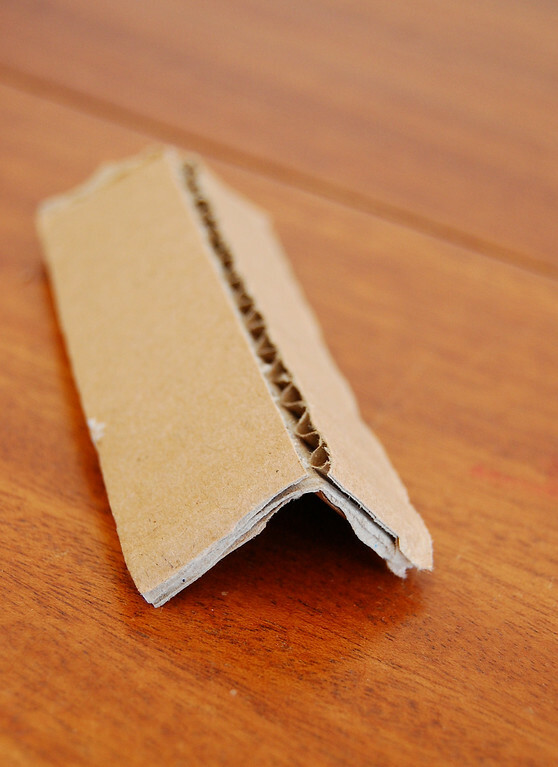 When you see a cardboard box, your first thought is to check the flute size and then cut it up into flat shapes and make something. 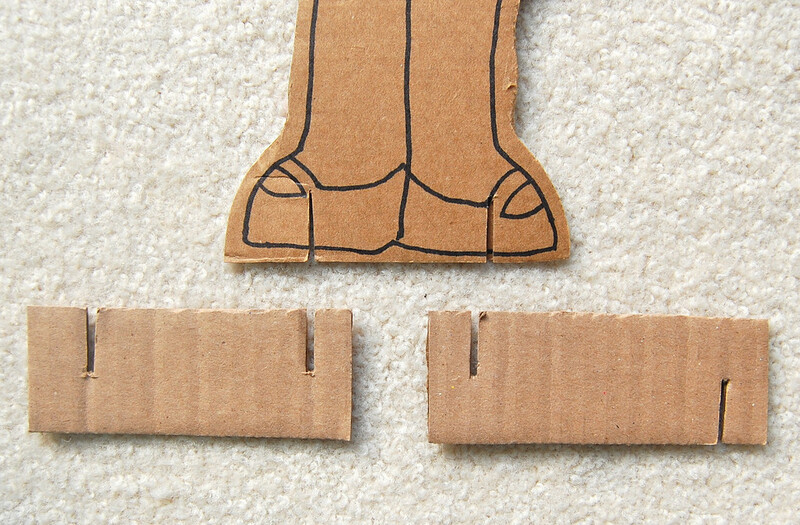 You hate, absolutely hate how the pre-existing fold lines of the flaps limit you to cutting out pieces of certain sizes. Whenever you see large pieces of cardboard, you froth at the mouth and begin to have visions of furniture and entire houses for victims of national disasters. If you were working with fabric, you'd be the one buying fabric in ridiculously large yardage, with plans to sew every single garment in the most recent issue of Burdastyle. Most of us vascillate between both roles, depending on what we can get our hands on. 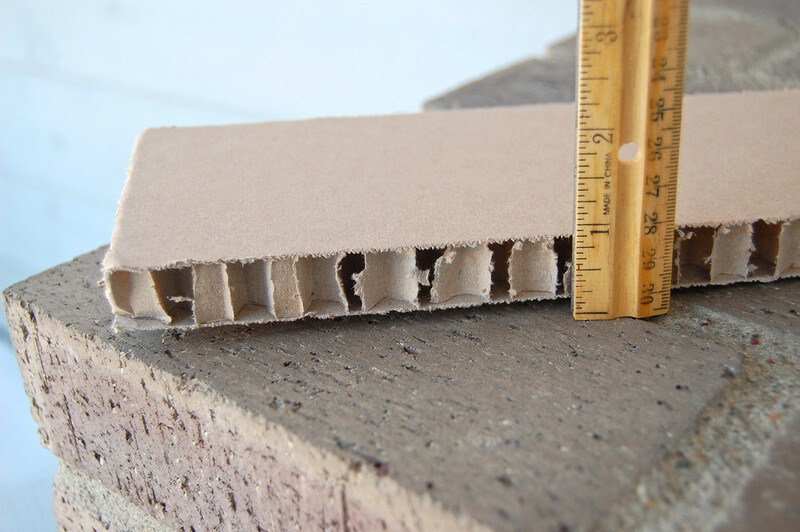 What Kinds of Cardboard Can I Use? Any kind, silly! They are all supreme. But some are more supreme than others. this is good for projects that require a lot of folding and rolling. Pick this for making cones, tubes and tiny boxes. doesn't roll well, but folds nicely when scored (will discuss this later). 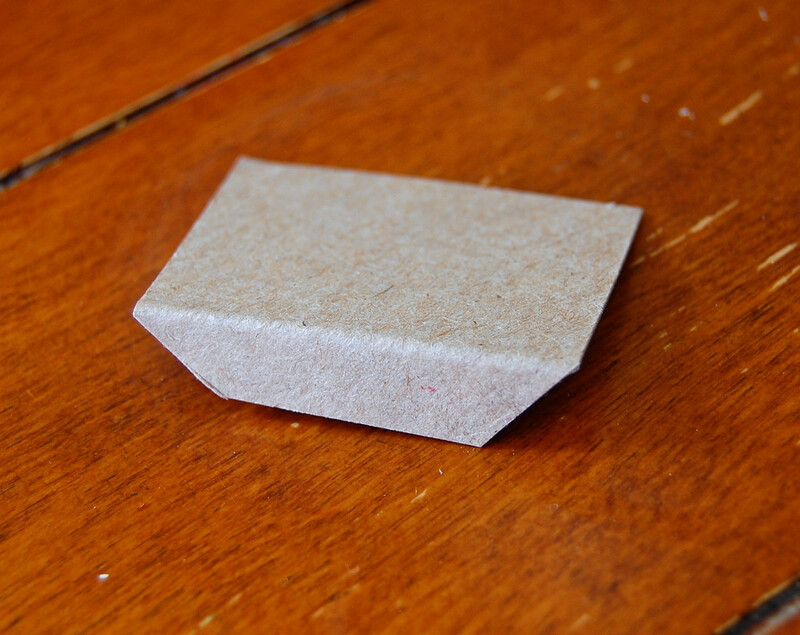 Structures made from this keep their shape better than those made from the cereal-box variety. 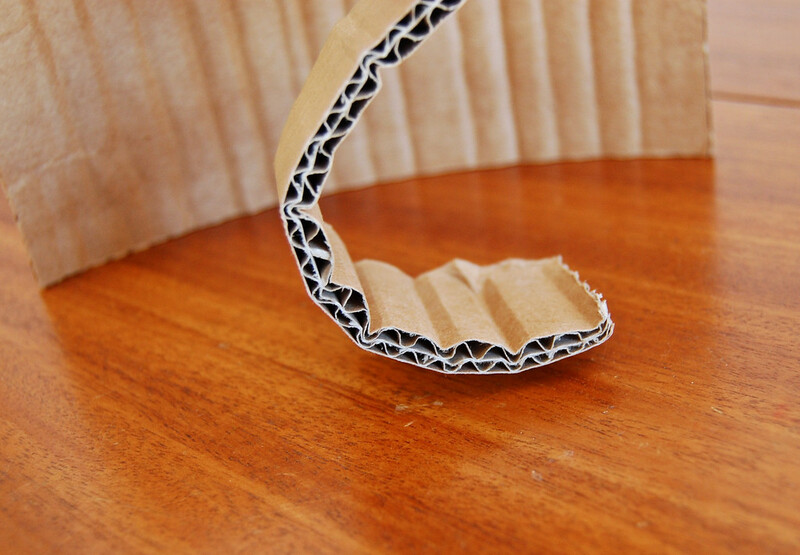 single layer of flutes (those wavy things) between two layers (called liners) of cardboard. which comes in different thicknesses. Check out the size of the flutes - the smallest flute (somewhere in the middle of the stack) is in a USPS priority mail box. 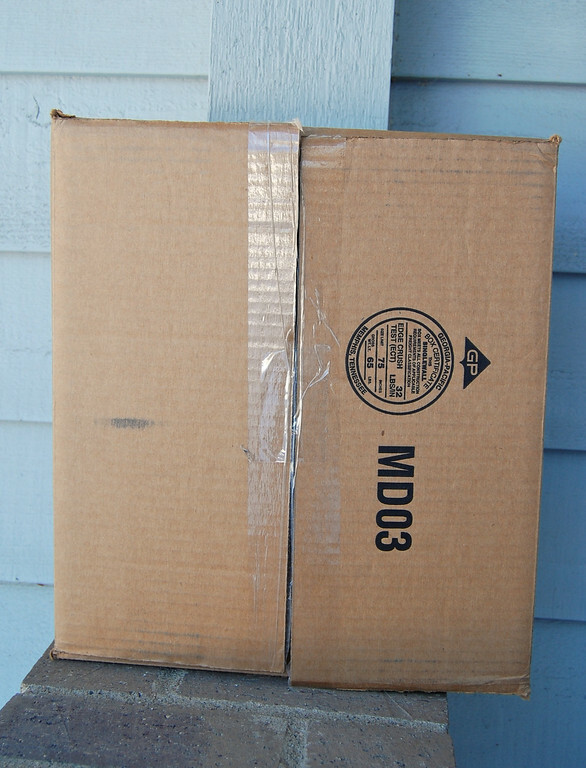 See - compared to the single wall cardboard below it. and has the prettiest pattern of corrugation. 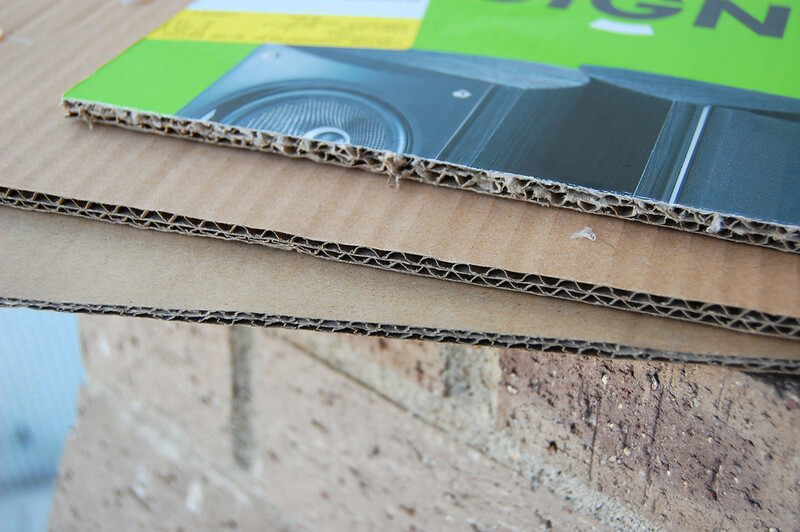 Quite different from the regular corrugated cardboard. Almost honey-comb like. I wish I knew what it was called. We found two of these strips in a box containing some household appliance, and used the first one for a ramp for matchbox cars. It lasted years. Slightly less rare, but equally valued is White Cardboard. 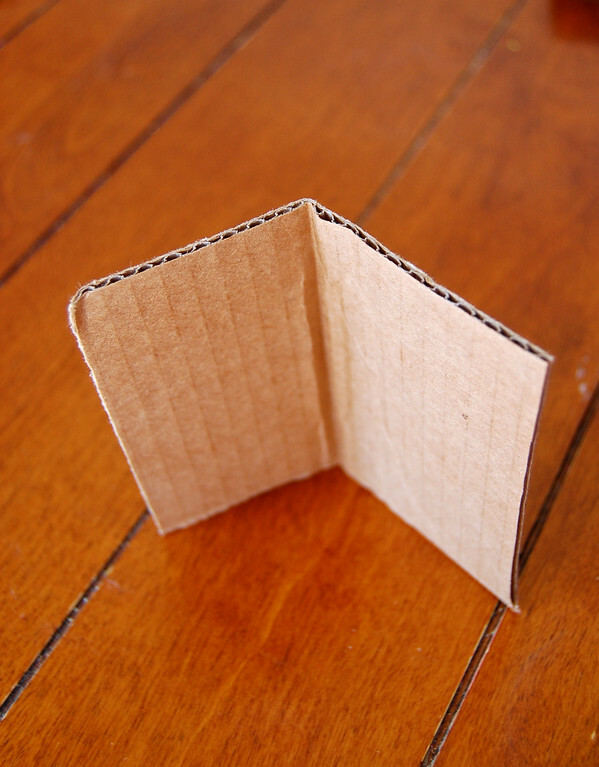 It's like the cashmere of cardboard. White on one side means the kids can have a field day coloring it in really bright colors. Whenever I find white cardboard, I save it for special occasions. 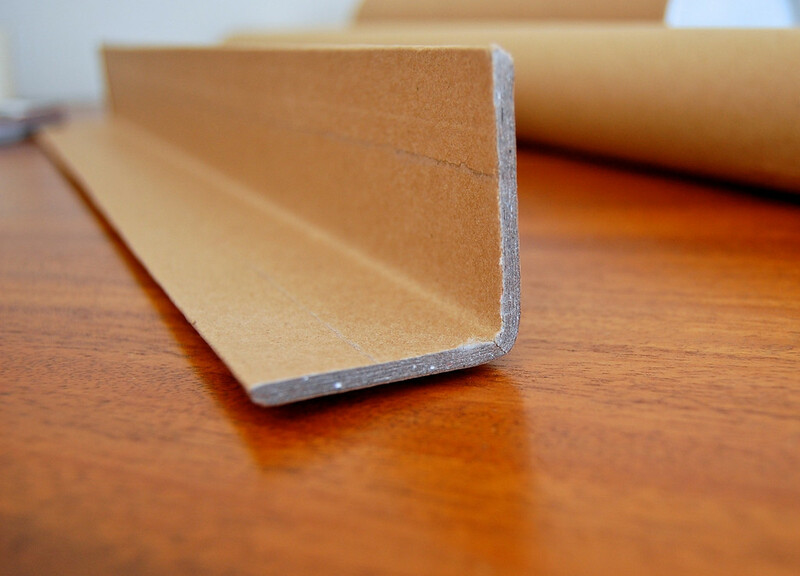 Then there are the other kinds of 'cardboard' like paper board, cardstock, poster board but you know those already. For cutting: kitchen shears and a craft knife/NT cutter/X-acto knife/box-cutter. 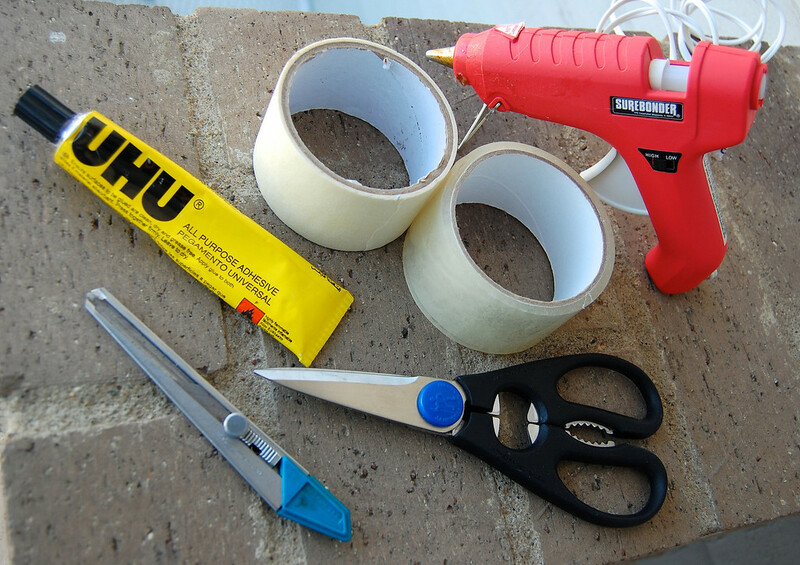 For gluing: hot glue gun, UHU craft glue, masking tape and packing tape. I've seen UHU glue sold in Michaels. 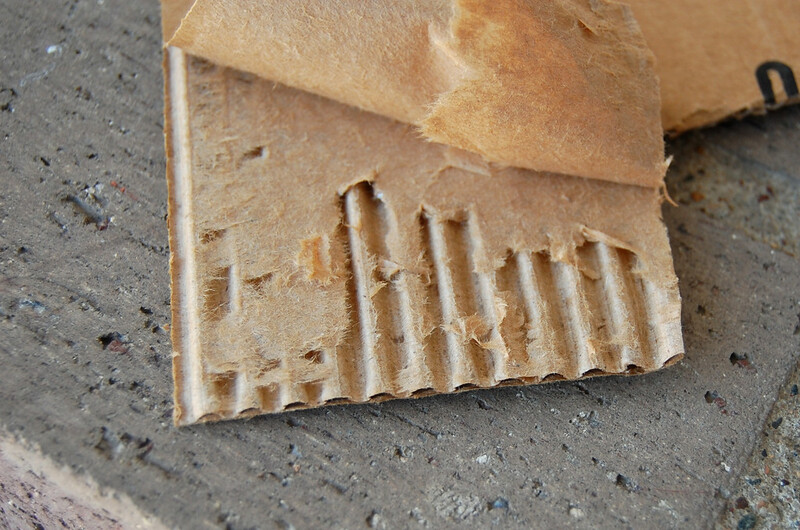 What Makes Corrugated Cardboard So Strong? 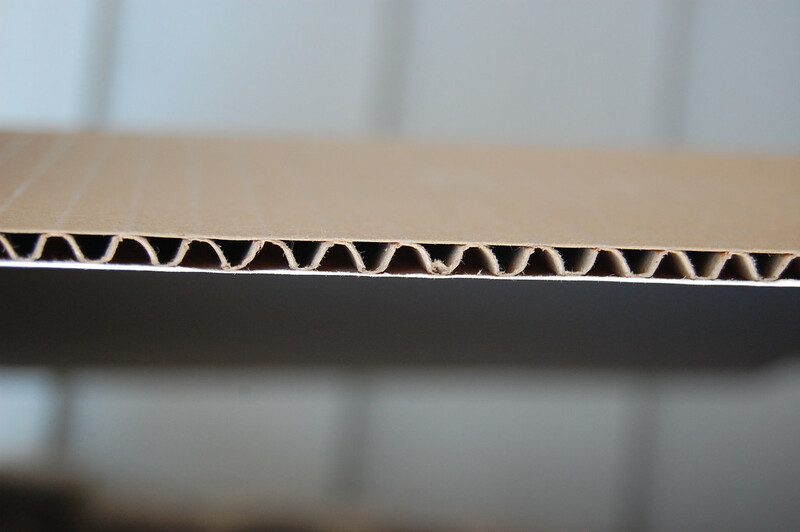 Corrugated cardboard gets its strength from the flutes between its liners. 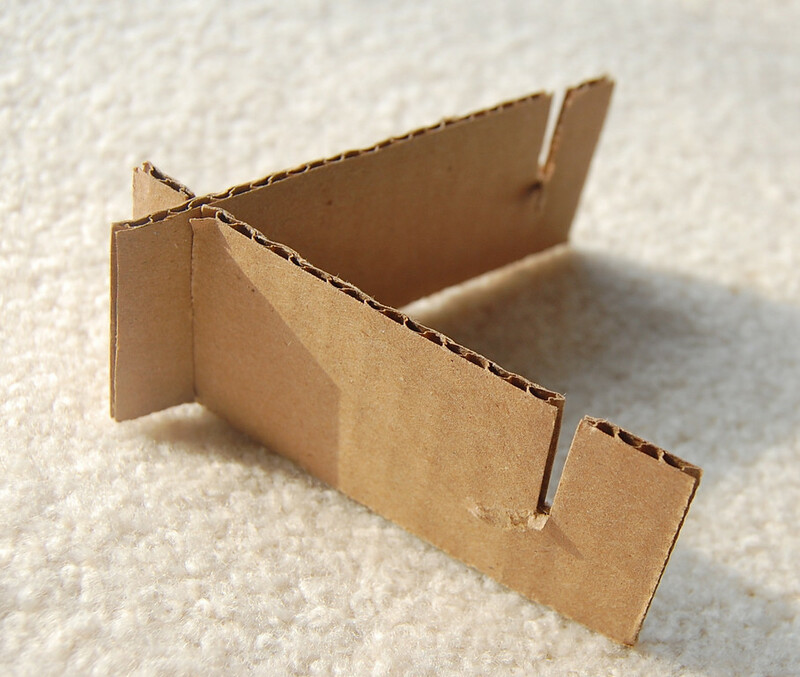 They dictate how you can manipulate the cardboard itself, but when used correctly, can add a lot of strength to a structure. 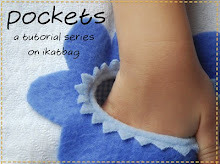 First, and most obviously, avoid including pre-existent creases, unless you want them for a particular reason. 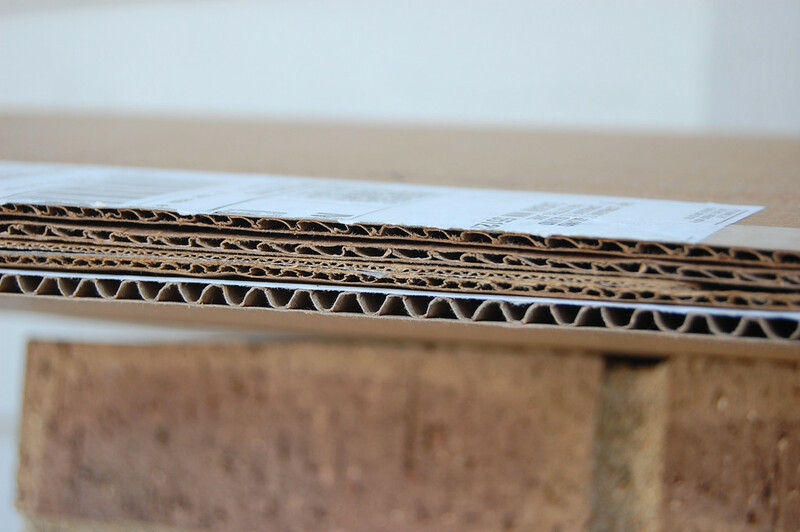 These are weakened areas in the cardboard. Second, make fold, bend and roll lines parallel to the flutes. Suppose you want to join two little pieces at an angle, like the walls of a tiny box. 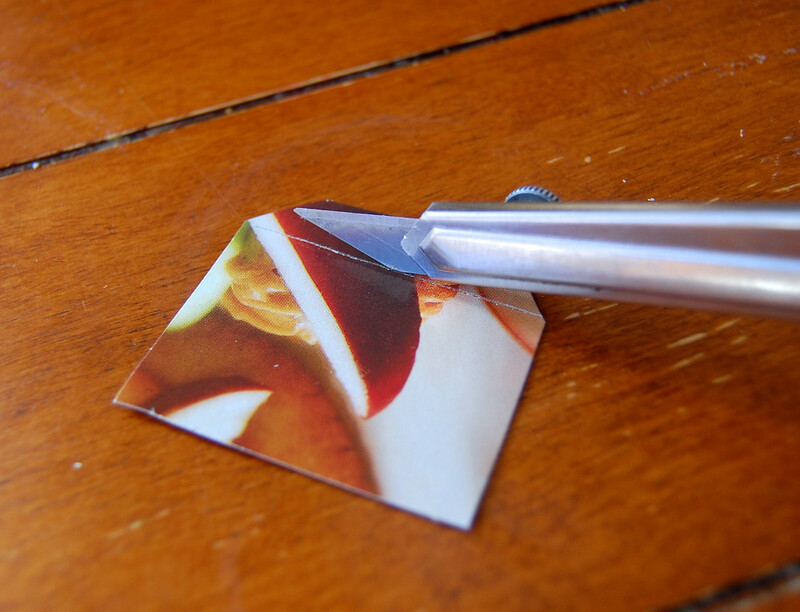 First, you'd need to make a little overlapping tab for applying some adhesive. Sorta like a seam allowance. For it to bend, you'd need to score a fold line. This just means you scratch a line with something thin that will weaken the surface but not cut through it. Like the back of a knife blade. 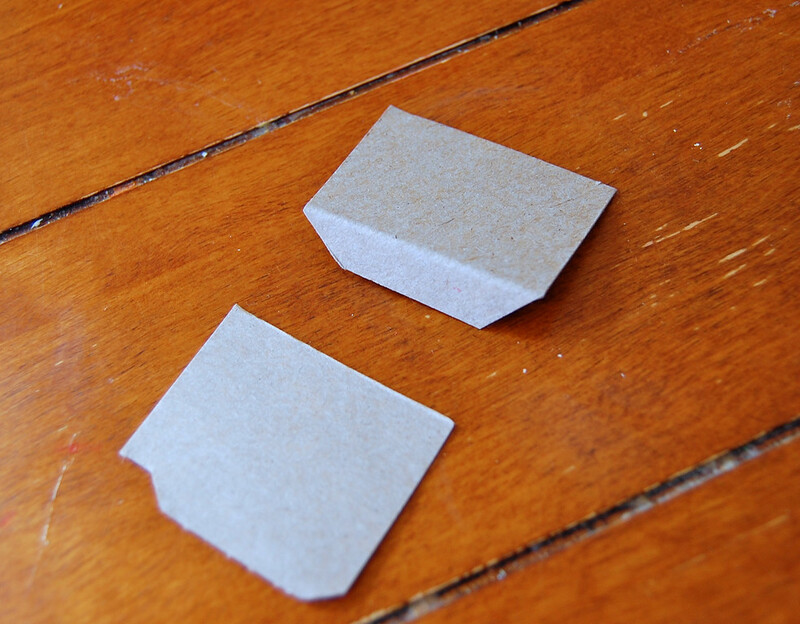 Then you can make a neat fold. and attach it to another piece. 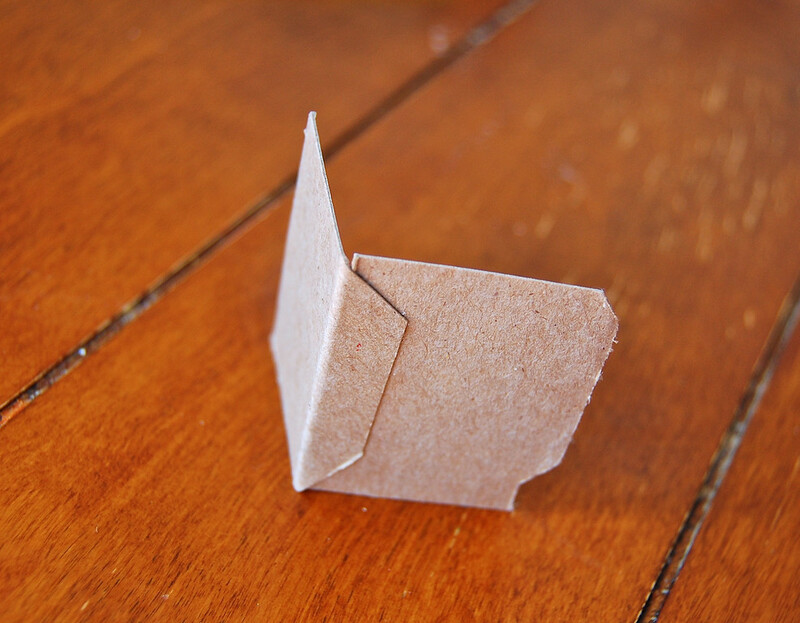 You could score and fold in any orientation because cereal box cardboard has no corrugation. 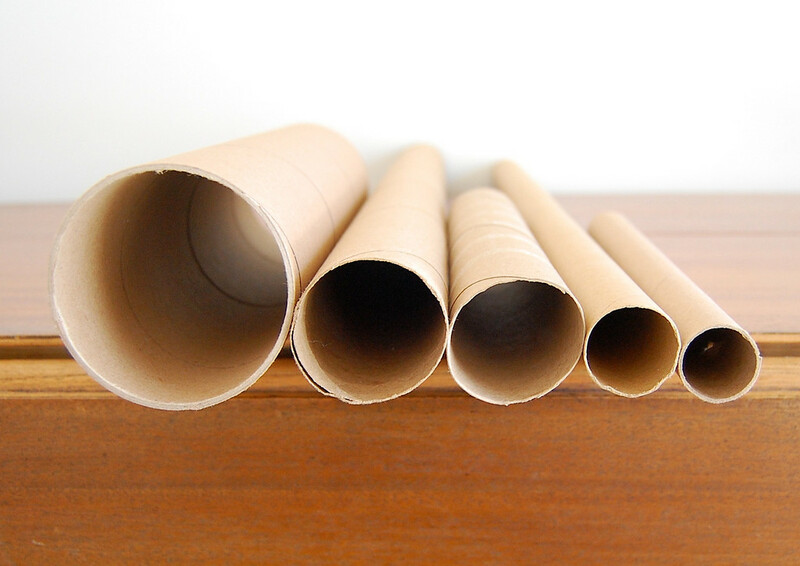 With corrugated cardboard, you'd have to pay attention to how the flutes are lined up. You'd want your fold line to be parallel to the flutes- this way you only distort one or two flutes in the fold and the rest of the piece remains strong. 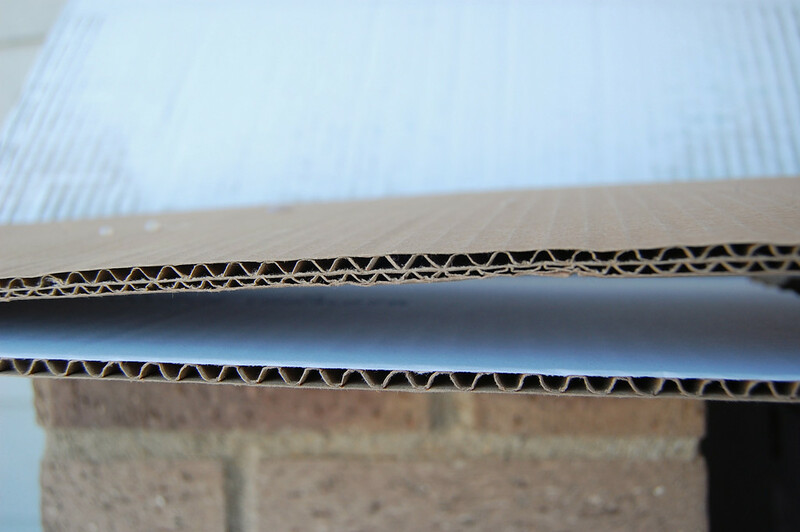 If the cardboard is especially thick, you might need to score the fold line first. before folding. Notice the upper liner and the flutes have had to split in order for the fold to happen. This means the fold is only as strong as that bottom liner layer i.e. much weaker than if you'd folded it parallel to the flutes, as we did earlier. is like making a series of gentle bends to attain a curve. Again this is done with the bends parallel to the flutes. 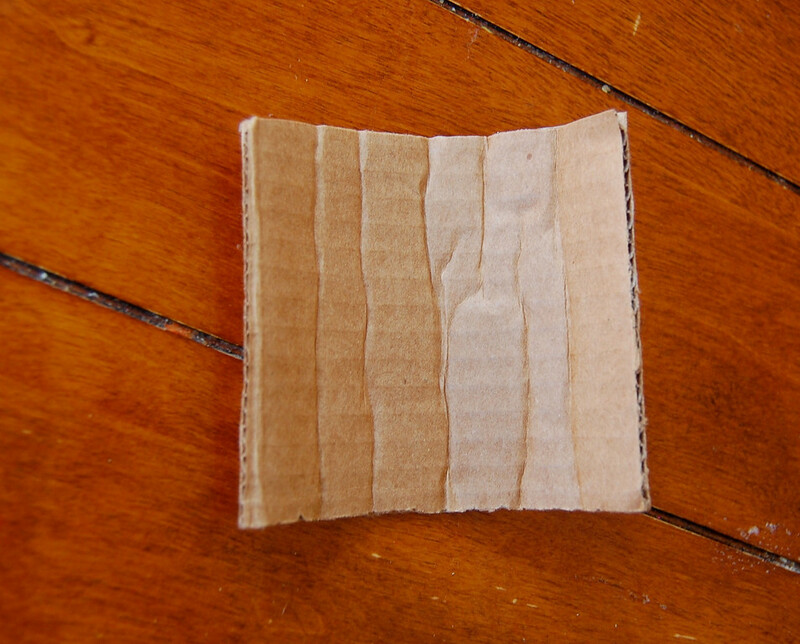 This is a thin piece of corrugated cardboard rolled in the wrong direction (perpendicular to the flutes) - there is a horrible, uneven mess of creases in the middle. 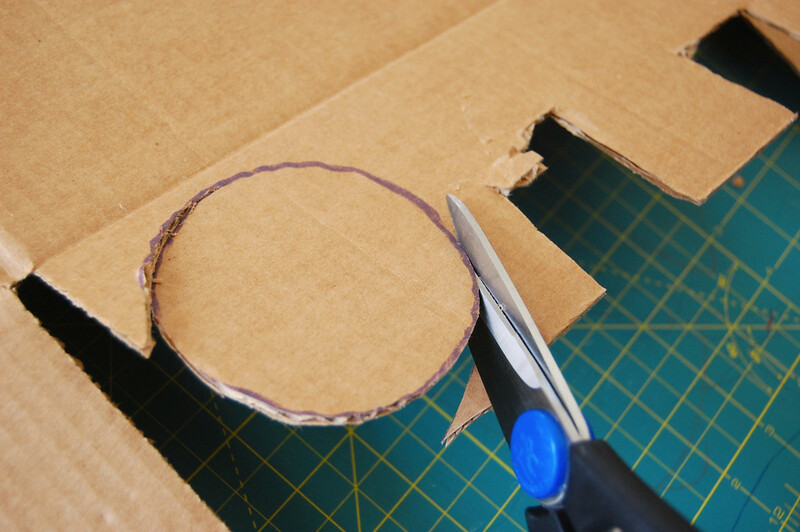 One of the questions I've most often been asked is how I cut cardboard. 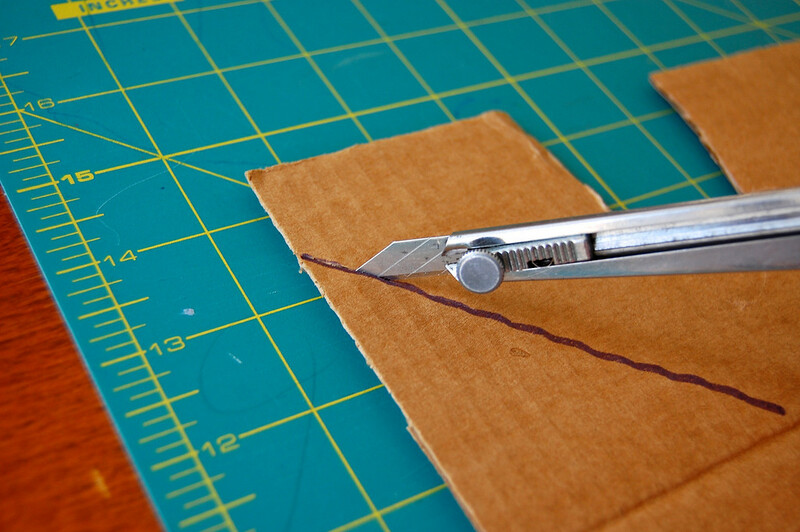 If the cardboard is thin but large and hard to manouevre with scissors, I use my craft knife on a cutting mat (yes, the same one I use for fabric). I draw the knife along a ruler edge for straight cuts, or free-hand around curves. 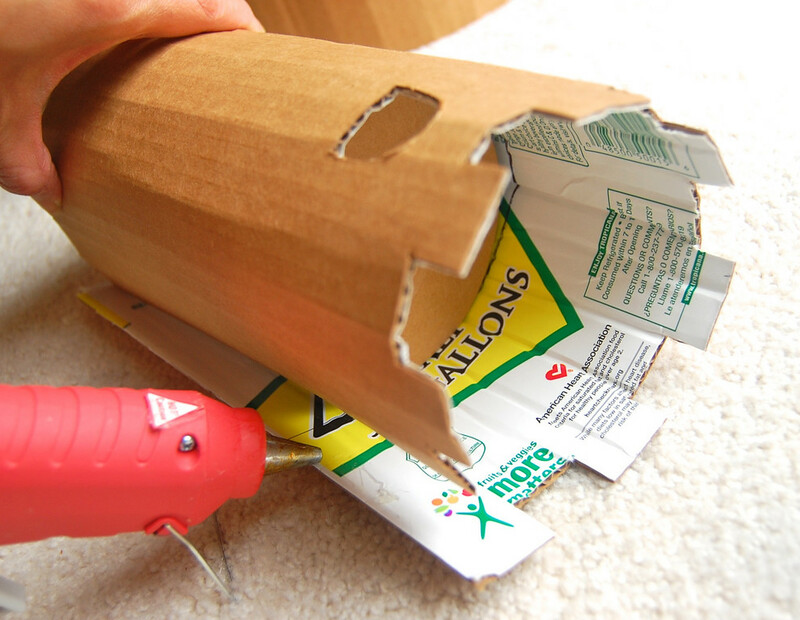 This is especially helpful in cutting out holes and windows. If the cardboard is thick, I use the same knife as a saw. 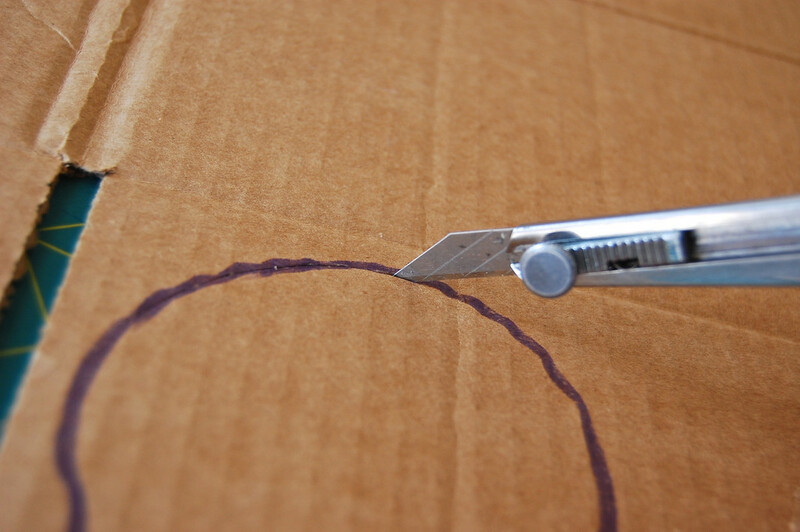 I hold the cardboard away from the cutting board and use an up-down sawing motion all around the outline. 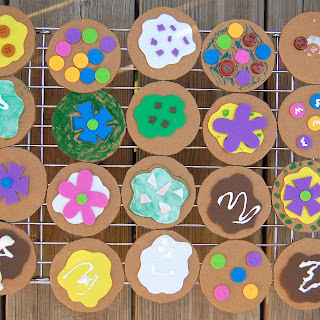 When making flat structures (like cardboard cookies and that fraction puzzle), Elmer's White Glue works OK. It's especially safe for children. When making 3D structures however, I don't use Elmer's White Glue. It's strong enough for wood, yes, but it dries slowly and requires either a clamp or someone to actually hold the pieces together in place overnight. If I am joining two pieces that don't require special, fiddly positioning, I use a hot glue gun. It's fast and strong. Otherwise, I use my UHU craft glue - it's fast, but not instant like hot glue. I can slide things around to position them for a few seconds before it dries. 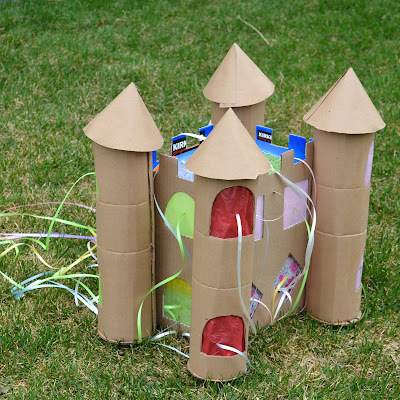 How Do I Design Cardboard Structures? I don't know. You'd have to look around you and get inspired, I guess. Look at architecture. Look at toys. Let the ideas percolate for a few months. Then sketch them out. 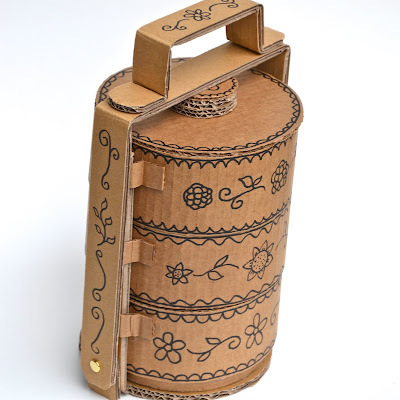 Anything made of cardboard can be translated into wood for a sturdier and more permanent product. 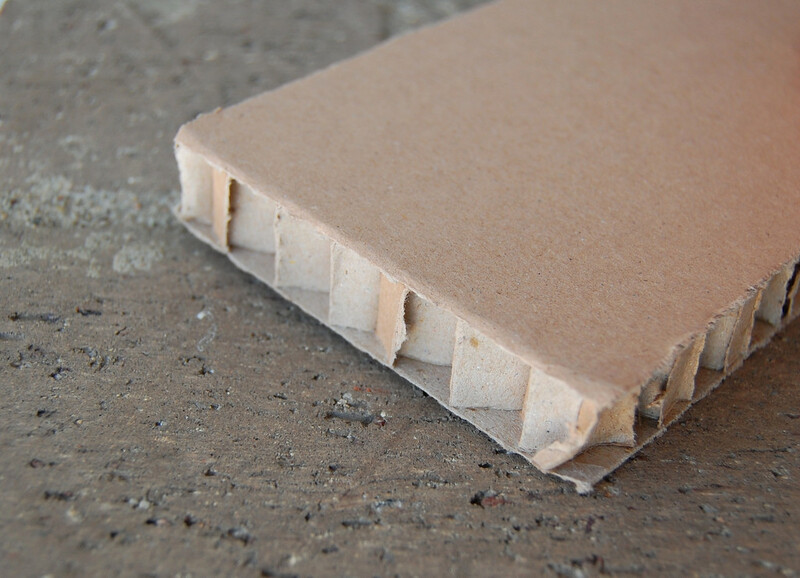 The converse is true - anything made of wood/plastic can be replicated in cardboard. Even furniture! 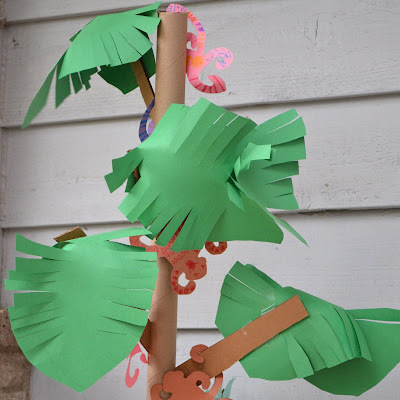 If you're new to cardboard, start with the cereal box kind of projects - cut out masks, make little teepees, retractable telescopes, indoor boomerangs, little cars for Playmobil. 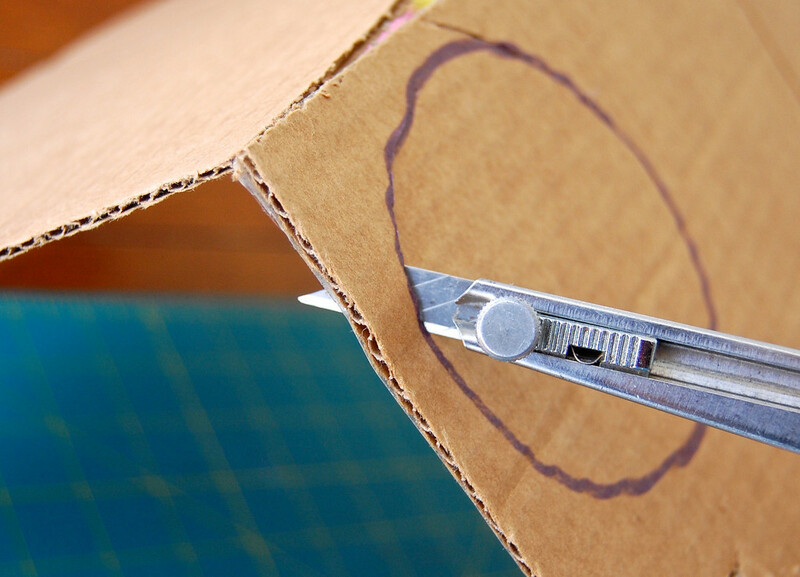 If you're ready for something 3D, grab a box and cut holes in it. 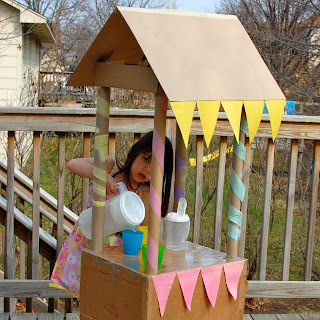 Turn it into a fishtank, a cage, a puppet stage, a washing machine, a castle. 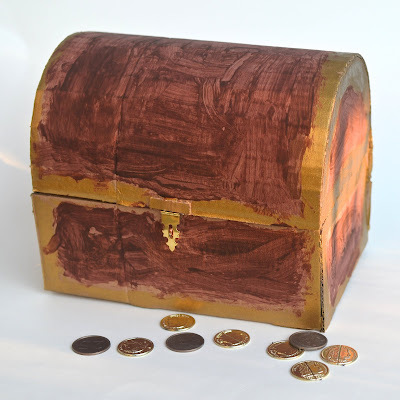 Ask your children what they think the box should become. I guarantee you they will have very strong opinions. It doesn't matter if everybody starts out making a featureless tunnel out of boxes and calling it a space shuttle. Over time, you will find the motivation to add things to it - a round window, wings, a flip-up door, maybe even wiggly little control knobs. Sometimes make toys for your kids, but also make toys with your kids, so they get to see you think, plan, build and develop an idea. Fun has so many levels! 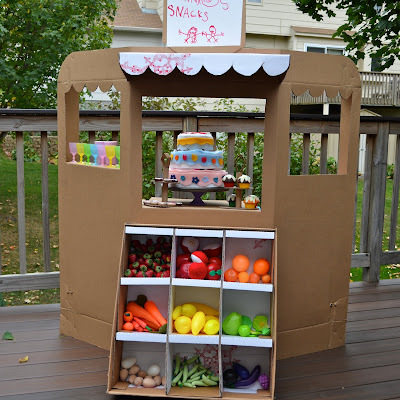 Here is a roundup of some old cardboard projects - child's play (literally!) compared to those real works of art I linked to earlier. 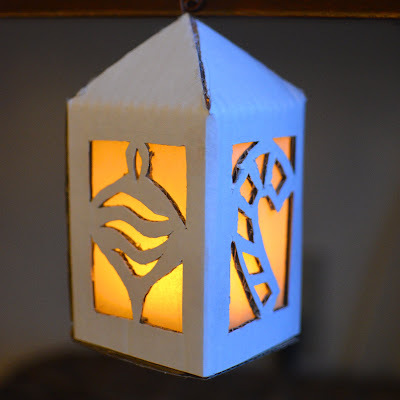 I don't usually include templates or patterns because the size of the product depends entirely on the size of the cardboard sheet/box I have to work with. And much as I'd like to build giant cardboard structures, I've been banned by the husband due to space constraints. Click on each of the pictures to take you back to (where available) the original posts. 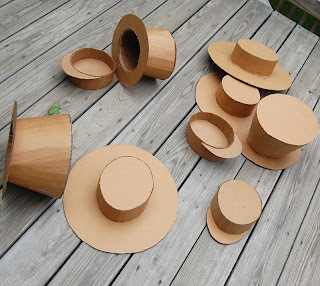 Also, here's a Cardboard Revolution post from 2009 linking to other people's amazing cardboard crafts that I've loved. 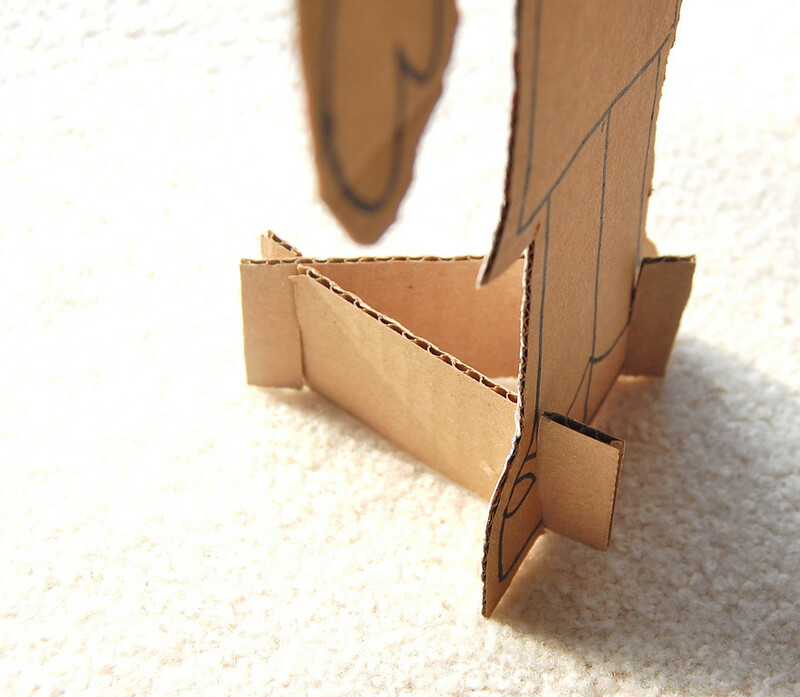 Coming up later this week: a simple cardboard catapult! 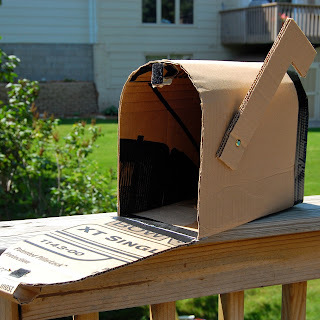 Updated 2019 to add: in response to many requests for instructions to make the cardboard mailchute, there is now a 2-in-1 pattern you can purchase here. 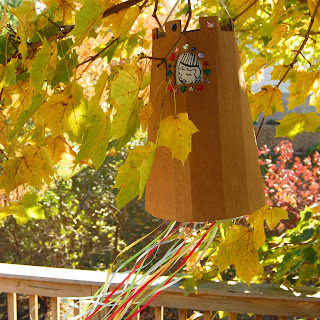 Included are instructions to make that mailchute as well as a fabric mailbag for mail carrier/post office pretend play! THANK YOU! I feel like you wrote this for me and I learned SO MUCH! I am eager to start immediately. THANK YOU! (And my kids thank you. And the big stash of cardboard in my garage thanks you. And my recycle man thanks you.) Awesome awesome. Thanks for putting the projects in one place too. My girls have been eyeing those purses you made for that party. Did you use special tape for the seams? 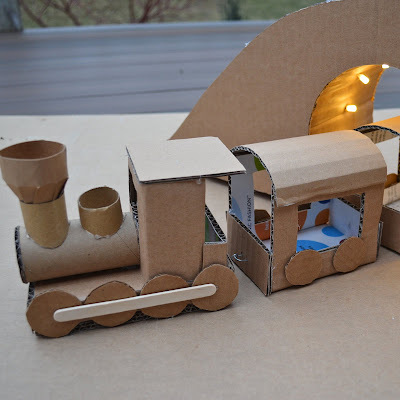 You are an excellent resource for cardboard Ideas! Thank you so much. 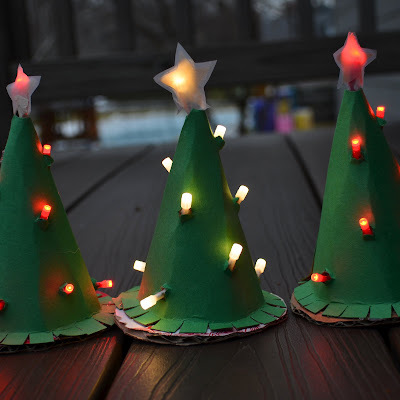 I try to keep card board to do crafts with the kids but I just can't ever think of anything. This really helps. Love this post, very inspiring. 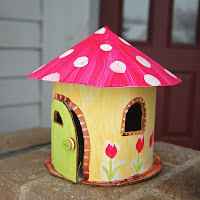 Love the cute projects too, the suitcases crack me up! I need to buy a box cutter. So much better than the kitchen knives I use. I've been saying that for ages. 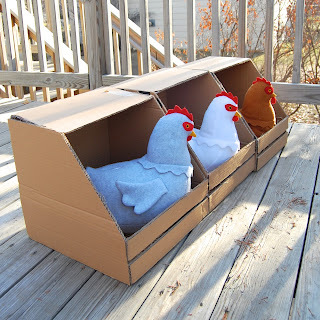 That cardboard furniture you linked to is amazing! I really enjoyed your tutorial! I think I need to pull out my glue gun a little more often! 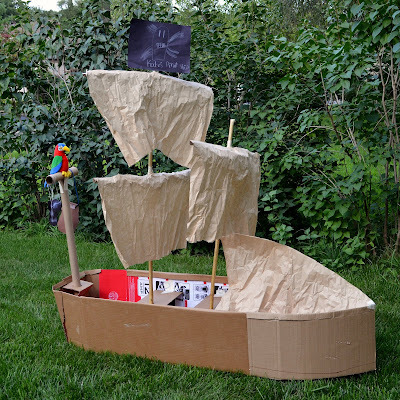 I have a huge stash of cardboard right now - it's all flattened behind the living room couch and the kids pull it out on a near-daily basis to use as a boat/rocket ship/car, etc. We haven't built anything that looks anything with it, though - yet, at least! Thank you! My kid has spent the last day saying "make excavator out of cardboard!" I've been saying "well, I don't know how to make the moving parts..." and he looks me in the eye and very sincerely says "Mommy. Try." So try I have been. Oh my goodness! This is incredible!! I'm already mentally cataloging all the cardboard around my house (and wishing that today hadn't been recycling today so I could take back that cardboard). Thank you so much! Hi, my name is Mafalda, I'm from Portugal. I'm a huge fan of your blog wich I visit since last year.. When I was little my mum used to put me and my brother and sister playing with crafts. 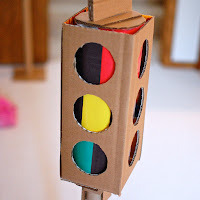 We played hours building stuff with cardboard and glue, dough or clay, paints and everything. I identify myself in your cardboard activities with your daughters and see it as an example of education through crafting. It's also an important lesson about ecology and stimulates imagination and criativity. I also think that most of those activities are really reflected in our lives when we grow up, and that we keep the aptness of building most of our stuff in many ways of life. This is totally awesome post! Enjoyed reading every word of it! Not to mention your wonderful creations from previous post! Love it! ok, I haven't read the post yet, but I wanted to tell you that I have your blog on my sidebar and yours is the only blog where I can't always tell if you've updated. The new post does not always show up on my sidebar, and the whole reason I PUT blogs on my sidebar is because I don't want to miss anything they write!!! Just wanted to let you know, if it helps for the fixing. . .
You are amazing! I still love fabric better :) but you make me look at my basement stash of cardboard differently. Maybe I won't recycle it. . .
Now I understand, what a fun teacher you are! Your work is probably not as precise as the Japanese or as detailed as some others, it's pure art! More than that, it triggers the artist/designer in every child. Beautiful! Thank you! You make such a great job with cardbord, so inpsire, so creative. I read you in Poland. 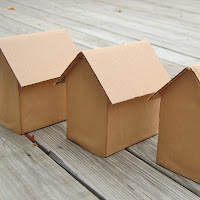 In this post I only miss a information about http://www.foldschool.com/ That was my start with cardboard, after it i found your blog. Thank you again. I am dying here! 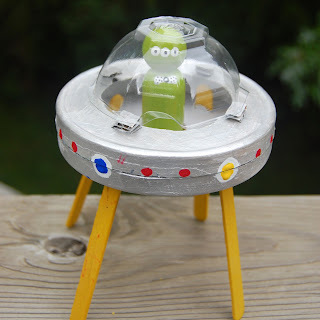 :-D I am convinced that one can build *anything* out of cardboard and hot glue. Good for you, Katherine! I'd forgotten about appliance stores! Why buy a new TV when you can get the free TV box? Now that's being smart. Thank you for sharing! Oh the things I could do with a 4' x 4' x 4' box..... must stop coveting now and pay a visit to the Appliance Outlet in the next county. Oh, but wait, the Large Structures Sanctions have still not been lifted in our house. Sigh. WOW this is an excellent job. Excellent post. OMG!!! Lier, you're like a blessing for me. I've just moved houses and have 30 cardboard boxes saved. The moment I unpacked, I thought to myself 'Hmm, I'm sure I can put them to good use and have been hounding the net for this information. Huuuuugggg for such a nice article. Justfeltlike: First, congratulations on surviving the move! And all the best for the settling in! Next, I am not sure if I can bear to think about your 30 cardboard boxes, I'm so overcome with jealousy. Hee! Enjoy them! Omg, I feel so kindred to you right now. People come over and make fun of my cardboard stash...now I can tell them I'M NOT ALONE! I love this! 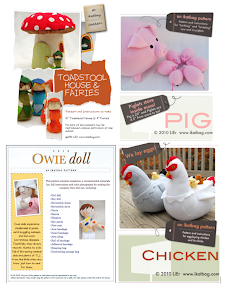 I've just found your blog via OnePrettyThing, this post is making me feel like a kid again, love love love all the fab ideas! Marceline, I'm glad this could help you. Wow - a gigantic harmonica in cardboard! I love it already! Holy Moly, Now that is an awesome post. Can't imagine how long it took you to put that all together. Great stuff, thanks a bunch! I am so excited to have found this post on StumbleUpon. 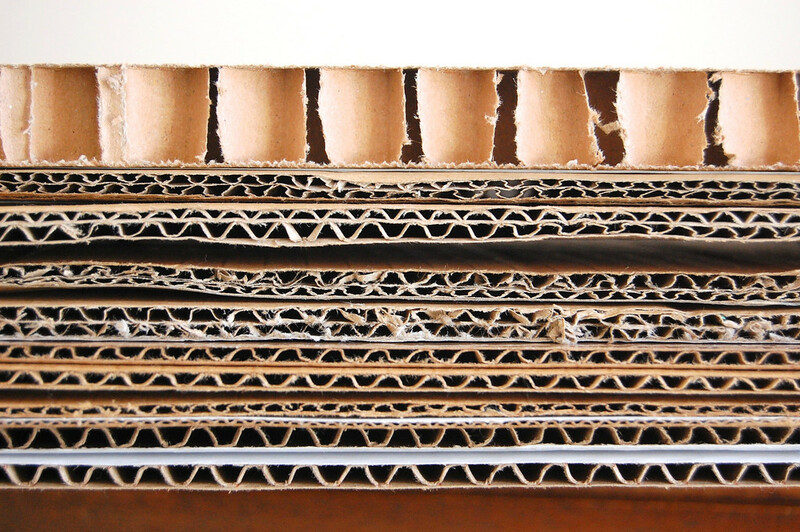 I have a stash of cardboard that I just KNOW I can do something with, but don't know what, or how, or how to start. This is an awesome inspiration for me!! 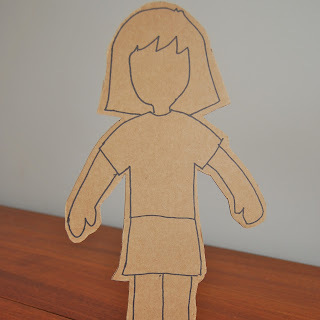 First on my list is making a wardrobe-type thing for American Girl and Build A Bear clothes. I am not alone! Though I do appear to be one of the few men who will admit to being a Bona Fide Cardboard Freak. (I'm ok with that.) Great post! I stash cardboard everywhere too but you have just opened up a whole new world of possibilities for me. I REALLY like the shelf thing close to the top. Thank you for posting this! Thank you! 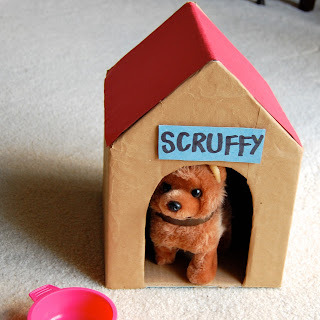 A friend just asked me to help her make a dog house for one of her daughter's fave stuffed doggies. Friend is going through a nasty divorce and most of the presents (money buys...) will be under tree at papa's house, so this is super important! I think we will put the dogs name on it but leave the rest of the decorating to her daughter. I need to get my thinking cap on for more projects! Thanks! This is a VERY HELPFUL how to article! thank you. This is a great blog! 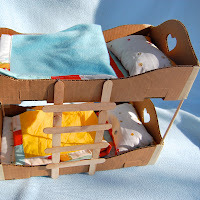 Another suggestion for acquiring cardboard sheets/boxes; printing companies/binderies. 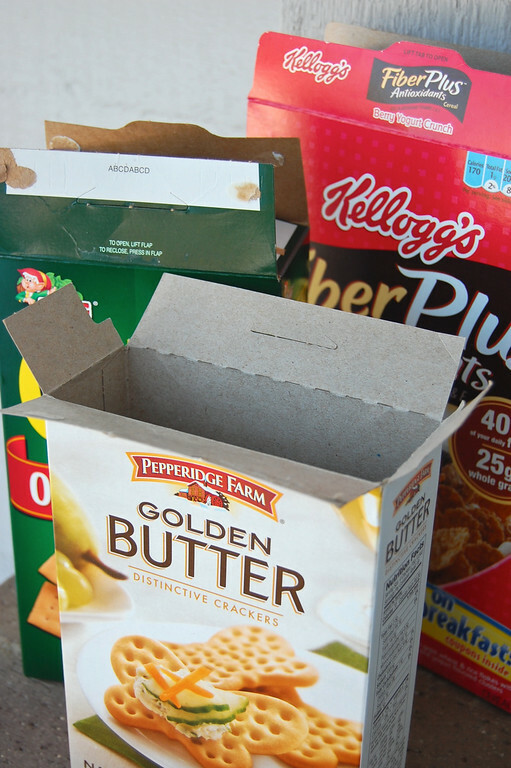 I currently work in a bindery and they always have boards, chipboards (cereal box type) and tons of boxes that go to recycling. Good Luck! Your blog is very inspiring. I used to work with paper, but for no reason I always collected cereal boxed, used toilet rolls and even corrugated boards. Now, I know they can be of use. Thanks a million! OMG! so glad i found your page! i have access to sooooo much card board and now i know what to do with it all!!! thanks! 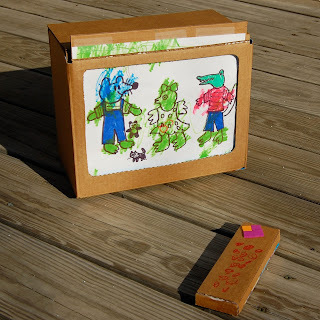 I found this cardboard is free blogspot. 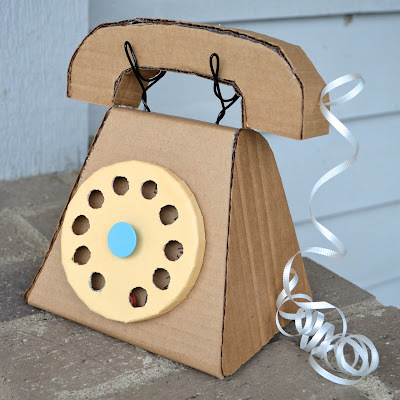 check it out on other uses for cardboard. I am absolutely amazed!! Just 3 days ago I started a cardboard collection for some reason. I have a large blue container with a lid (you can't see into it! )and started throwing stuff in there that seemed interesting! Thanks so much for these ideas! As a Mimi of 3 gorgeous grandchildren this can come in real handy when they visit! Saw this on Pinterest and thought to myself... This person is AMAZING. You've inspired me to say the least!! this is completely awesome! 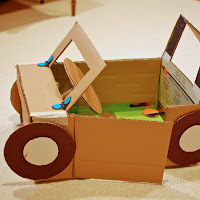 i am all for making things out of cardboard. 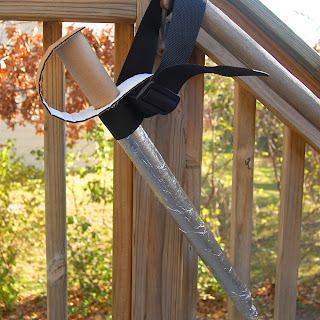 i don't even recycle out a paper towel tube without asking my son if he needs it for something. 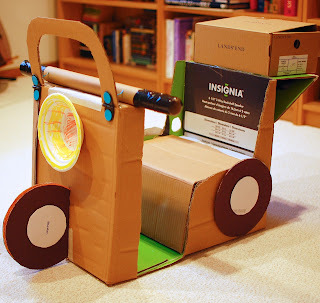 i use a cereal boxes for scrap booking and when i was on bedrest with my daughter we remodeled our kitchen and my son and i made a most excellent car out of a giant sturdy sink box. we had it for weeks and it was great fun making it with him especially since i couldn't do much else. YOU are the BOMB with cardboard!!! This post alone could help justify my stash of cardboard to my husband... Perhaps, he might just might understand now! And I'm sharing with my FB friends and teachers at school! With school budgets being cut at every corner, teachers can always use inspiration to make something with what they have on hand! Love your ideas. Saw you from Money Saving Mom. Am a follower now, and can't wait to keep up on all your creativity. Amen honey! 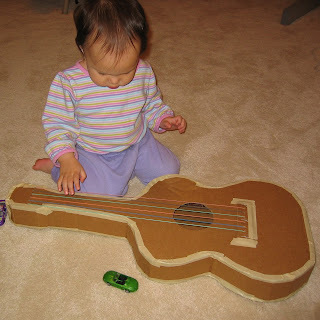 Cardboard has been a play staple in our extended family since I was little. All of my dollhouses were cardboard creations my mother and I made together. 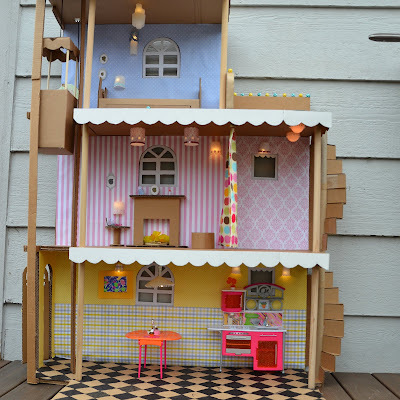 We passed the baton with our little one a couple of years ago (creation here=> http://homemakingorganized.com/blog/2010/03/felt-doll-house-update/). She has since become her own cardboard dynamo creating an indoor slide (for herself!) a checkers board, and more. Great tutorial! A women after my own heart. I LOVE Cardboard. 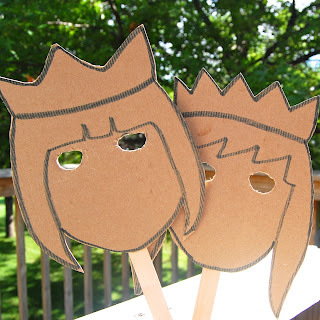 I loved making projects with my girls out of cardboard. We had a giant jukebox once for a turn back the clock school skit. 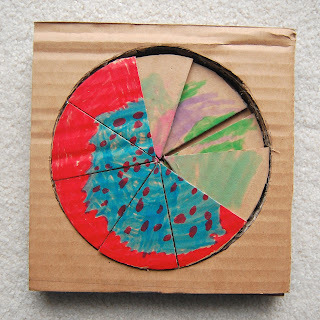 so wish I had a picture The pizzeria gave us the round cardboard - that we turned into records we put a boom box inside playing music. 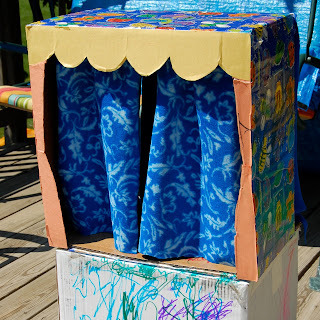 Two fridge boxes cut open and put side by side make a nice "shopping mall" back drop for a another school skit. 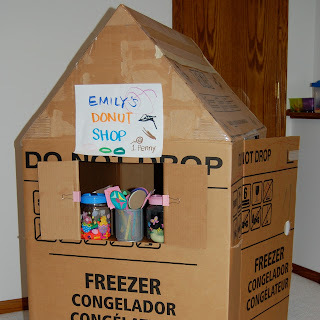 Then we re-purposed it and made a great play house for the girls - well till the basement flooded and we had to throw it out. 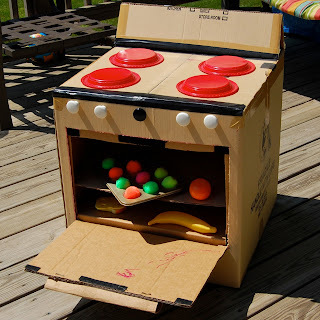 Using a lawn mower box, bbq grill box, and a copy paper box with mailer tube, the plastic round insert from a candy box and camouflage book covers we got from the national guard to make a tank for an army/navy challenge the youths at church were having. I work at a school and get tons of college posters in mailer tubs OH do I have a nice stock pile - yet no kids to do projects with anymore. bummer. A great inexpensive medium for any type of project. Oh my goodness, I laughed out loud when you described the Bona Fide Cardboard Freak. I used to work for a company that printed blueprints/ blackline for construction companies. 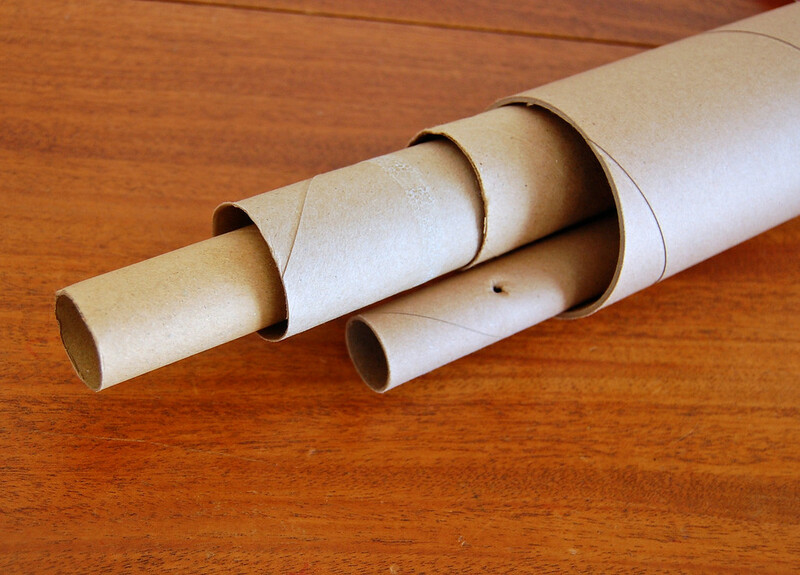 We always had dozens of extremely sturdy, long cardboard tubes that were at the core of the paper rolls we printed on. I used as many as I could for my own projects, but there were always so many we had to throw away. So look around town for a place that does this type of printing, especially mom-and-pops, because I'm sure they'll be more than happy to save some space in their dumpsters. Whee! I had no idea! Thanks for the tip. I just went online to look up companies like these. None in the immediate vicinity, but I will keep an eye out for them in farther-off cities. Thank you! thanks for a great post. loved it. kraftykat424: Awesome!!!! Thank you! Thank you! Finally, a reason not to hate tax season! And I checked out your honeycomb void filler link - argh! It's so expensive!!!! So much for cardboard being free. Maybe I can act pathetic and convince one of those companies to sponsor me and send some freebies. Yes. That's a good plan. 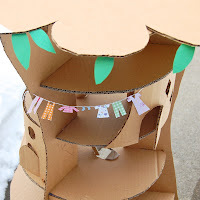 I am in the midst of making a cardboard house for my kids 4 and 1. It is so fun i find myself thinking about how to extend and improve it all day. Its almost as if i become obessessed with it. So you can imagine When i found this page.... I am so happy i almost couldnt breathe. 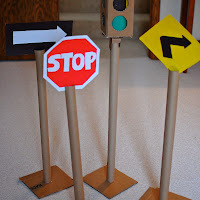 Thank you so much for so much time in explaining everything we need to know about cardboard and painstakingly taking all the pictures to show. Well now holy moly! I wish I would have seen this before mothers day when I started my walk thru the cardboard forest lol. But the one thing I can say is that thru my own trial and error I discovered the things you talk about here! That makes me feel wonderful. It is so much fun to get into these projects and see where they take you. I had no idea really where my project was going until I started cutting and shaping the box...I still look at it and think...huh I wonder what else I can build! I am cardboard empowered...and obviously not alone! I am inspired by your passion for cardboard!!!! I collect it for "some future craft" but never quite know what to do with it. I use PVA glue that comes in massive tins/jars in DIY stores. It dries best overnight and you do have to press and hold it together but not for long (leaving it overnight to completely set is the best), but it sets fairly quickly and not immediately - you can still position and slide it into place for about 1 minute. It also washes off your fingers and clothes very good.